If you work as a graphic designer or with graphic designers in any capacity, no doubt you are familiar with the Pantone Matching System, which is the standard color matching system across pretty much all industries. Each year, Pantone chooses a “Color of the Year.” The color is decided upon at a secret Pantone meeting held in a European capital each year. The color is reportedly chosen in conjunction with many of the cultural influences that Pantone believes are relevant in our present lives. The color is meant to capture the spirit of the year. 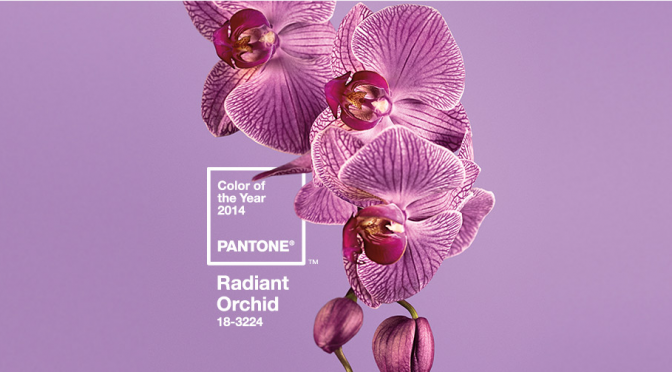 Pantone’s Color of the Year for 2014 is Radiant Orchid. Last year’s color was green. Lots of things are green. Not all that many things are “radiant orchid.” Our team worked very hard to find promotional or customized marketing products around the office that are orchid. We found these two things that are close. To help our designers, idea-makers and customers get into the color of the year we created a Pinterest board. What promotional items do you think will look best in radiant orchid? Pinnacle’s new blog post is RADIANT! Trade Show season is coming! When the holidays come to a close, most businesses can count on one thing: the start of tradeshow season. January brings with it some of the largest and innovative tradeshows of the year. Starting with CES and PPAI in Las Vegas and rolling into car shows, boat shows, and wedding shows that will eventually dominate the spring. There are almost 1,000 tradeshows in January alone across the United States. • They want to be entertained. • They want free stuff. Leffler explains that you can entertain people in a number of ways. First, by exhibiting a creative booth space. Something more than just a folding table. And then, it is imperative that you give people your time. Last year, promotional reusable bags and customized cinch bags were top-sellers for Pinnacle Promotions. They are great surfaces for your corporate logo, and you can guarantee that all the other items that people collect at the tradeshow will then be stuffed inside YOUR bag. As Leffler states, they are going to need a place to keep all the other swag! Humor is another way to get people to remember your name. The Learning Revolution, by Gordon Dryden and Dr. Jeannette Vos explains that one of the keys to memory is emotion. Make them laugh, make them smile, and they will remember you. The blah blah blah is always popular for every type of tradeshow because it makes people smile, and could possibly help to spark a conversation. This is a stress ball AND a device holder! Are you headed to a tradeshow this January? What’s the best promo item you ever received at a tradeshow? Tradeshow season is coming. Are you ready? “That’s a Tier 2 problem.” Ummmm…what? My laptop was not working. I had no idea what was wrong with it. So, I took my computer to a store that sells that computer, and that computer only. Upon further inspection, the technician kindly let me know that I have a “Tier 2” problem. I asked, “What is a Tier 2 problem?” He answered, “About $250.” Ummmm…what? Many industries have their own terms that are proprietary to the market or industry. The promotional products industry is no different. We have assembled a few of our favorite terms here that some customers may know, but these terms might not necessarily be household names. Not only will we define them for you, but we’ll do it in less than #sixwords! Any other terms you want us to explain in #sixwords? We’re here for you! Check out our FAQs for more information. Nike is a company that usually brings to mind cutting edge technology and extreme precision. So, how could this have been prevented? We’re confident that if Nike had used Pinnacle Promotions, this wouldn’t have happened. That’s because we have live, breathing human beings (we call them Account Managers & Coordinators) working on your projects, guiding you through the process, and checking the integrity of your brand at every step of the way. You have extra sets of eyes scouring your order to make sure each and every little detail is right. They can let you know when if your logo will be lost against the contrast of a t-shirt. The will suggest tweaks that will make your chosen promotional product stand out. We make sure there’s ample time and opportunity to spot any dreaded typos or mistakes, even if your order is a rush one. It’s why we at Pinnacle are left scratching our heads in confusion when we hear about massive imprint orders that go so terribly wrong that they end up as viral news stories. Nike’s mistake seems near trivial when compared to Missouri State University’s gaffe earlier this year. The University misspelled its own name on around 17,800 bags. These bags were given to students when they were purchasing new books for the semester. I wonder how many students rethought their enrollment after this mistake. Considering the size and enormity of the order, we would have expected their vendor to have raked over the logo with the same attention that a watchmaker devotes to his prize clock. At Pinnacle Promotions, all orders get this level of detail regardless of order size, but one would think that at $70,844 order that someone would have caught the error. We know you have seen misprints out there. What is your favorite brand oopsie that made it’s way to production and distribution? Social Media Marketing: What’s the Benefit for Us? My co-worker, Lee recently shared an article with me from Forbes.com, The Hidden Benefits of Social Media Marketing: Why Your Strategy May be Working Better Than You Think. It actually put a positive spin on all the social media marketing efforts that most companies are investing in. It kind of hit home with the two of us. Sometimes it can be challenging to measure your return on investment with social media, especially for small businesses. This article discusses 10 ways in which social media may be working for you that you don’t realize. Give it a read if you have a chance. The big benefit of social media for Pinnacle is that it is a place where we can build our community and create a forum for our clients and partners. We share information, articles, and new & unique products that we think our clients would be interested in and monitor their engagement. From time to time we will ask our community questions about what they are looking for or what they would like us to offer more of. The feedback we receive is taken to heart. We discuss our clients needs as we continuously plan our future efforts online and off. We also utilize our social networks as a place to reward our loyal followers or fans. We do free promotional giveaways and offer exclusive discounts and sales. This offers our customers an additional incentive to follow us and engage. Everyone likes to receive something for free, especially if it is a unique product they couldn’t get anywhere else. We recently gave away Gadget Grip Dot’s on Facebook, little tactile buttons you can place on your smartphone or tablets that offer a very unique branding opportunity. So far we have seen that Facebook has been the social network that we receive the most engagement on. It has been really fun to grow our community there however Twitter, Pinterest, LinkedIn, and YouTube have also been networks that we’ve seen growth and opportunity. What social networks are you participating in? What have you found has been your biggest benefit? If you live anywhere on the East Coast, especially the Southeast as we do, there’s no doubt that you’ve seen an influx of pictures of car thermometers on your friends Facebook pages showing the temperatures soaring above 100 degrees. We’ve even put one on our Facebook page here at Pinnacle, though it seems that 102 was not much to brag about compared to other cities. However, 102 degrees is no joke when you’re outside competing in a 6.2 mile road race and that’s what 60,000 people intend to do this Independence Day as they participate in the Peachtree Road Race, one of the world’s largest 10Ks. Creative Commons License photo credit: chippenziedeutch Read More! When ASI released an article spotlighting the 15 Most Popular Promotional T-shirts, Number Two on their list was concert t-shirts and I have to agree. Do you know what today is? Aside from it being five days until your taxes are due, it’s also National Grilled Cheese Day. Step away from the W-2s and into the kitchen because this is one holiday that’s worth celebrating. Creative Commons License photo credit: fritish Read More about National Grilled Cheese Day! I use Pinterest both personally and professionally. Personally, it’s a little easier; I mostly pin recipes, home improvement ideas, sometimes workouts. But it’s never anything I personally wrote or created. Instead, I use it a virtual bulletin board. It’s a place where I can save my bookmarks visually for easy and aesthetically appealing access.